We have terminated the production and the selling of model HS-100. The wood to be tested may have some warpage, which the sensor of HS- 100 protruding from the body is capable of measuring. Used frequency for the HS-100 is 20MHz while that for similar products from competitors is 0.5MHz. 6mm spacing between sensors, The HS-100 has 34mm spacing, which enables the high-frequency wave to penetrate inside and to measure the moisture content of deep part. To avoid the sensitive sensor from being affected by human hand, The HS-100 has the tall body. The HS-100 can correct at the range of 10-40mm thickness , and of 100-990kg/cm3 or 0.10-1.00g/cm3 density. 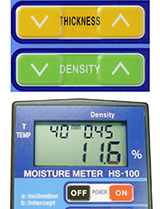 It can measure the moisture content from 3 to 100%. An internal thermometer can correct temperature automatically (manual setting also available). The HS-100 has passed the strict screenings in Japan where there are a lot of wooden houses. The HS-100 has been accredited as a quality water content meter by the Japan Housing and Wood Technology Center's performance criteria of water content meters used for softwood lumbers（Accreditation No. 1-15-001).